Friedrich Witt: Symphony in C Major "Jena"
Here's an interesting disc of Beethoven and almost-Beethoven in recordings once issued on LP by the mail-order Concert Hall label. 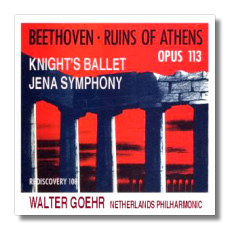 From Beethoven's incidental music for The Ruins of Athens, most people know the Turkish March and possibly the overture. Athens has been overrun by the Turks, but Kotzebue's play reassures us that the arts still flourish in the city of Budapest. (It will come as no surprise that Kotzebue wrote this music for the National Theater in Budapest!) Here's the rest of the music, and it is much rarer on CD. There are several choruses, a duet for soprano and baritone, and a string of short arias. One might guess that this is early Beethoven, but it comes from 1811, and it's pretty good stuff, although one assumes that Beethoven could write music like this in his sleep. Goehr gives it his all, even if the Turkish March sounds more cute than threatening. (That's Beethoven's doing anyway, not Goehr's.) Particularly noteworthy is the full-voiced and attractive singing of baritone David Hollestelle, who sounds a bit like Hermann Prey. A Knight's Ballet (or "Musik zu einer Ritterballet") is early Beethoven, composed in 1791, to be exact. Apparently with Beethoven's permission, his patron, the Count von Waldstein, took credit for writing it himself! (Perhaps Beethoven hoped that he could use the gift to his advantage later on.) It is even rarer on CD. After an introductory March, there is a German Song, a Hunting Song, a Romanze, a War Song, a Drinking Song, a German Dance, and a Coda. (So much for the life of a knight!) None of the eight sections is more than two minutes long. This music sounds not at all like Beethoven, so it is not surprising that this work's true authorship remained questionable for so long. Goehr ensures that the ballet's incipient pomposity never comes to the fore. This is not a particularly polished performance, but it is honest and jaunty.